In this study, a cable-suspended transportation system using a small-size helicopter was investigated. For a secure flight, it is necessary to suppress the swing of the suspended load. For this purpose, a cable angle feedback system was adopted because it is easy to mount the corresponding measuring device on a helicopter. Delayed feedback control was applied for efficient swing damping. The control parameters were obtained using a simple planar double pendulum model that takes into consideration the coupled dynamics of the helicopter and the load. To build the model, the system parameters were identified through frequency response flight tests. In this paper, an appropriate design strategy is reported for a trade-off relationship between vibration damping and piloted handling qualities; the robustness of the control method against disturbances and signal noise was verified by comparing the delayed feedback control method with the real-time angular velocity feedback control method. The damping effect was verified by performing flight tests with three cable lengths. M. Sonobe, M. Miwa, and J. Hino, “Effectiveness of Delayed Feedback Control Applied to a Small-Size Helicopter with a Suspended Load System,” J. Robot. Mechatron., Vol.28, No.3, pp. 351-359, 2016. K. Nonami, “Prospect and Recent Research & Development for Civil Use Autonomous Unmanned Aircraft as UAV and MAV,” J. of System Design and Dynamics, Vol.1, No.2, 2007. D. Fujiwara, J. Shin, K. Hazawa, K. Igarashi, D. Fernando, and K. Nonami, “Autonomous flight control of unmanned small hobby-class helicopter Report 1: Hardware development and verification experiments of autonomous flight control system,” J. of Robotics and Mechatronics, Vol.15, No.5, pp. 537-545, 2003. T. A. Dukes, “Maneuvering heavy sling loads near hover Part I: Damping the pendulous motion,” J. of the American Helicopter Society, Vol.18, No.2, pp. 2-11, 1973. T. A. Dukes, “Maneuvering heavy sling loads near hover Part II: Some elementary maneuvers,” J. of the American Helicopter Society, Vol.18, No.3, pp. 17-22, 1973. C. Poll and D. Cromack, “Dynamics of slung bodies using a single-point suspension system,” J. of Aircraft, Vol.10, No.2, pp. 80-86, 1973. L. S. Cicolani, A. Cone, J. N. Theron, D. Robinson, J. Lusardi, M. B. Tischler, A. Rosen, and R. Raz, “Flight test and simulation of a cargo container slung load in forward flight,” J. of the American Helicopter Society, Vol.54, No.3, 2009. C. M. Ivler, M. B. Tischler, and J. D. Powell, “Cable angle feedback control systems to improve handling qualities for helicopters with slung loads,” AIAA Guidance, Navigation, and Control Conference, Portland, Oregon, 2011. C. M. Ivler, J. D. Powell, M. B. Tischler, J. W. Fletcher, and C. Ott, “Design and flight test of a cable angle/rate feedback flight control system for the RASCAL JUH-60 helicopter,” the American Helicopter Society 68th Annual Forum, Fort-Worth, Texas, 2012. M. Bernard, K. Kondak, and G. Honmel, “Load transportation system based on autonomous small size helicopters,” The aeronautical J., Vol.114, No.1153, pp. 191-198, 2010. F. E. Udwadia and R. E. Kalaba, “Analytical Dynamics: A new approach,” Cambridge University Press, 2007. M. Bisgaard, J. D. Bendtsen, and A. Cour-Harbo, “Modeling of generic slung load system,” J. of Guidance, Control, and Dynamics, Vol.32, No.2, pp. 573-585, 2009. 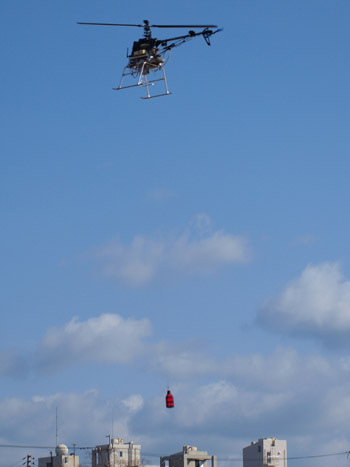 M. Bisgaard, A. Cour-Harbo, and J. D. Bendtsen, “Adaptive control system for autonomous helicopter slung load operations,” Control Engineering Practice, Vol.18, No.7, pp. 800-811, 2010. C. Adams, J. Potter, and W. Singhose, “Input-Shaping and Model-Following Control of a Helicopter Carrying a Suspended Load,” J. of Guidance, Control, and Dynamics, Vol.38, No.1, pp. 94-105, 2015. F. E. Udwadia and P. Phohomsiri, “Active control of structures using time delayed positive feedback proportional control designs,” Structural Control and Health Monitoring, Vol.13, No.1, pp. 536-552, 2006. F. E. Udwadia, H. von Bremen, and P. Phohomsiri, “Time-delayed control design for active control of structures:principles and applications,” Structural Control and Health Monitoring, Vol.14, No.1, pp. 27-61, 2007. A. G. Ulsoy, “Time-Delayed Control of SISO Systems for Improved Stability Margins,” J. of Dynamic Systems, Measurement, and Control, Vol.137, Issue 4, 2015. M. Sonobe, Z. Chen, M. Miwa, and J. Hino, “Cable angle feedback control for helicopter slung load system using delayed feedback,” J. of Unmanned System Technology, Vol.1, No.3, pp. 100-105, 2013. K. Hazawa, J. Shin, D. Fujiwara, K. Igarashi, D. Fernando, and K. Nonami, “Autonomous flight control of unmanned small hobby-class helicopter, Report 2: Modeling based on experimental identification and autonomous flight control experiments,” J. of Robotics and Mechatronics, Vol.15 No.5, pp. 546-555, 2003. B. Mettler, M. B. Tischler, and T. Kanade, “System identification modeling of a small-scale unmanned rotorcraft for flight control design,” J. of the American helicopter society, Vol.47, No.1, pp. 50-63, 2002. M. B. Tischler and R. M. Remble, “Aircraft and rotorcraft system identification: Engineering methods with flight test examples,” AIAA education series, 2006.